The White cheeked Pintail duck or Bahama Pintail duck (Anas bahamensis) is a dabbling duck of the Caribbean, South America and the Galápagos Islands. Dabbling ducks are typically birds of fresh, shallow marshes and rivers rather than of large lakes and bays. Dabbling ducks are good divers, but usually feed by dabbling or tipping rather than submerging. Like many southern ducks, male and female are similar, but the female has a duller bill and face and shorter tail. Females are slightly smaller than the male. 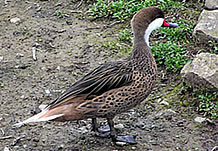 The White cheeked Pintail duck is mainly brown with white cheeks and a red-based grey bill (young birds lack the pink). White cheeked Pintail ducks have a red triangle at the base of the beak and a metallic green speculum. Adults have brown upperparts with black feathers bordered with pale buff on the back. 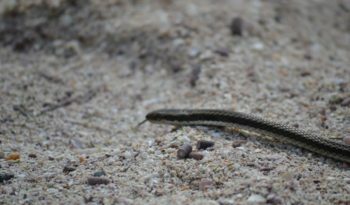 Their tail is pointed and yellowish. Wing coverts are brown. 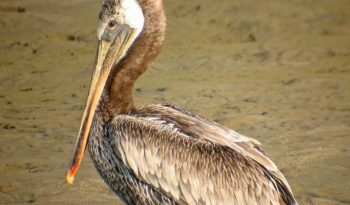 Great coverts have yellowish tips. 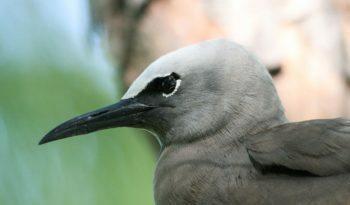 Tertials are blackish with pale brown edges. Secondary bases show a metallic green band and black sub terminal band with broad yellowish edge on the tip. 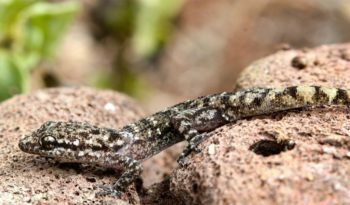 Underparts are warm brown, spotted with black on the breast and belly. Undertail coverts are yellowish. Underwing is dark, except paler central band, blackish flight feathers and pale trailing edge. Crown and nape are brown, slightly spotted with dark. Sides of the head, throat and upper neck are pure white. Bill is blue-grey with red sides at base of upper mandible and black nail. Eyes are brown. Legs and webbed feet are dark grey. The young White cheeked Pintail duckare soft brown. White Cheeked Pintails are an endemic sub species restricted to the Galapagos and you will see them flying long distances on the ocean, cruising from one island to another even though not often. The White cheeked Pintail duck cannot be confused with any other duck in its range. The White cheeked Pintail duck occurs on waters with a degree of salinity, such as brackish lakes, estuaries and mangrove swamps. 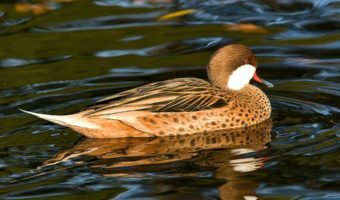 The White Cheeked Pintail feeds on aquatic plants and small creatures obtained by dabbling. The nest is on the ground under vegetation and near water. The White Cheeked Pintail is relatively silent. Males may utter a low whistle and females produce a weak quacking descending in pitch. The White cheeked Pintail duck is usually seen alone or in pairs, or in small group of 10 to 12 birds, but also in larger flocks of up to 100 birds and more. White Cheeked Pintails form pairs after a post-breeding moult. Breeding varies according to the range. Their nests are situated on the ground, near water. It is concealed among and under the vegetation of the shore, or among the roots in mangroves. Females lay around 6 to 10 creamy eggs. Incubation lasts about 25 to 26 days. The White cheeked Pintail duck is a rather tolerant bird, it does not like to be approached much by visitors, however sometimes is possible to get at a ‘close up’ range to them. It is a fearful and shy bird. White Cheeked Pintail populations seem to be stable. 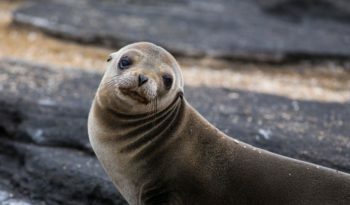 Some smaller populations as Galapagos subspecies may be threatened due to reduced distribution. 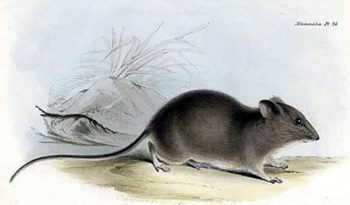 A. b. rubirostris in South America. The latter species may be partially migratory, breeding in Argentina and wintering further north.